Are you tired the traditional fall colors? You know, the yellows, oranges and reds combined? Those colors our parents and grandparents pulled out the closet to add a little extra love in the room at the beginning of Autumn. I know this too well myself! I can say that being a event designer I find inspiration in almost anything especially nature, seasons, and natural elements. I dare to be different, bold and unique creating designs and styles that could seem a bit risky! 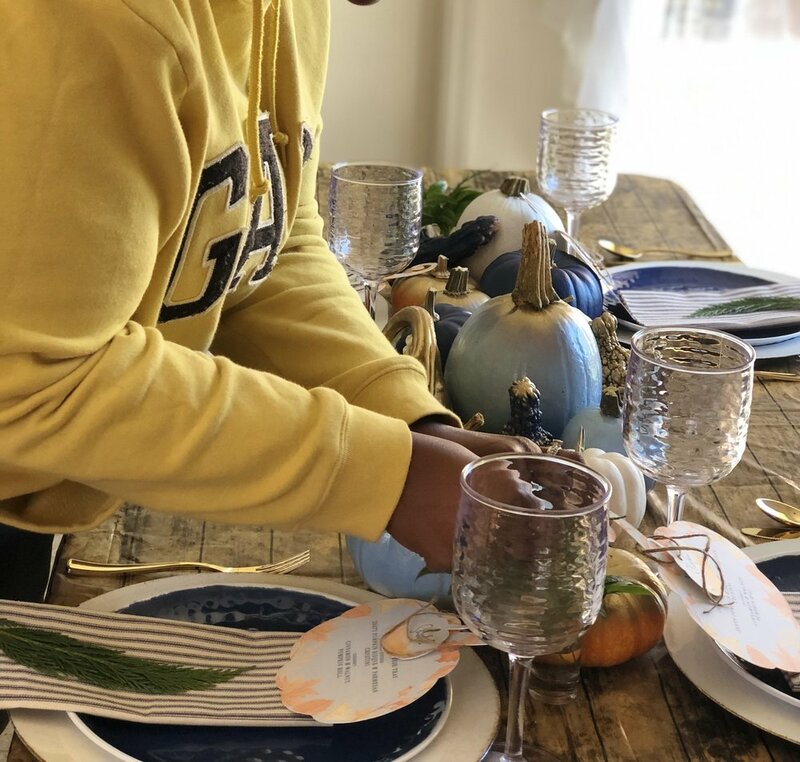 The inspiration for this tablescape first came from my obsession of Fall. I guess can say I love Fall, it’s warm, cozy, and inviting. The breezy weather allows my family to spend more time together for some indoor shenanigans! As a busy mom with two boys, thick cardigans are my go to and the boys actually get to dress in way nicer clothes like flannels instead of their favorite summer Dry-fit athletic wear. I love designing non traditional themes that have original pieces I can add my own twist on. Of course, you can't have Fall without pumpkins and gourds. But who said they have to stay completely original?! I went for a sweet and savory look, the bolds with hints of soft complement perfectly. Navy blue and sky blue, accompanied by metallic trims of gold made an amazing color palette which really appealed to the eye keen for details. Leaving the stems original, I spray painted the pumpkins and gourds with matte and glossy paint which turned out quite better than I expected. 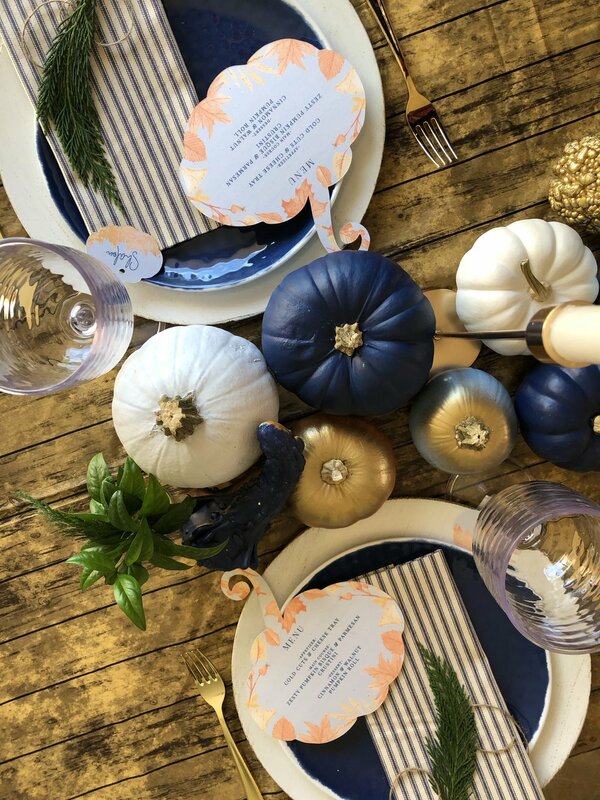 In love again once the pumpkins and gourds were placed in a perfect flow centered on the wood tablecloth. Yup! You read right, tablecloth!!!!!! 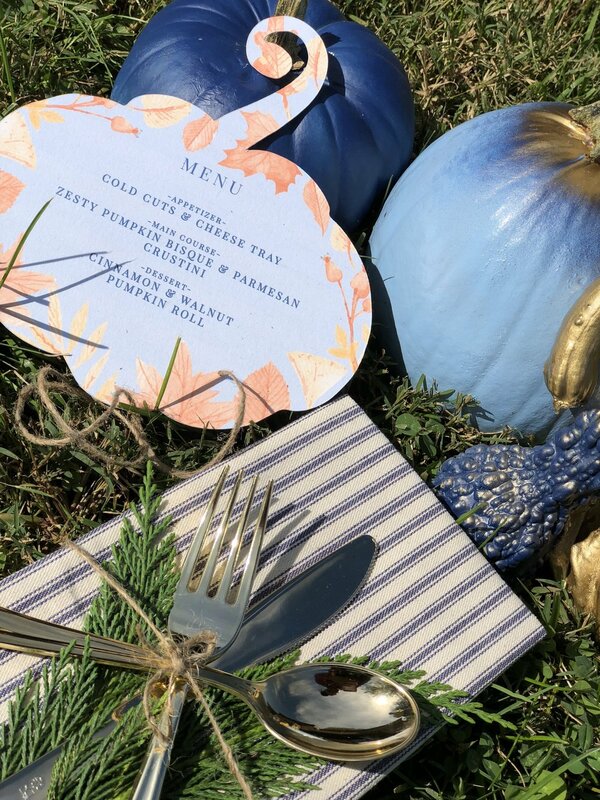 What’s a tablescape without a flawless place setting. I went for a distressed glossy off white charger plate with a hammered navy dinner plate. I handmade the napkins from a textured fabric bought from Walmart. Yes Walmart! Oh, I forgot to mention I love textures. Textures give that extra balance of detail my eyes crave for. The garnish of greenery I can think my neighbor for later. Thanks Neighbor!!!!! 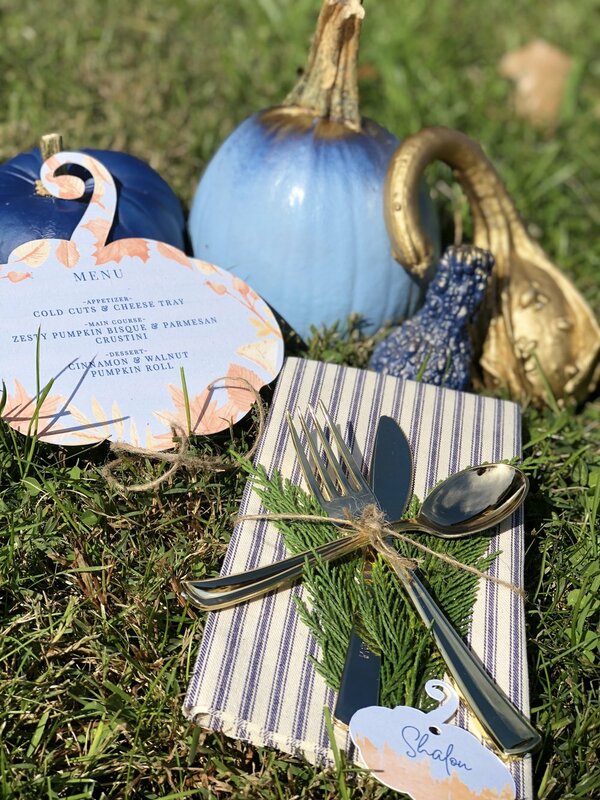 The water color themed custom menu and place cards created by Octane Design Studios add that personalized touch leaving your guest feeling special, thought of and also informed of what type of foods planning to be served! It just sets the tone for a nice fellowship when you know what's coming…food wise….ummm yummy!! 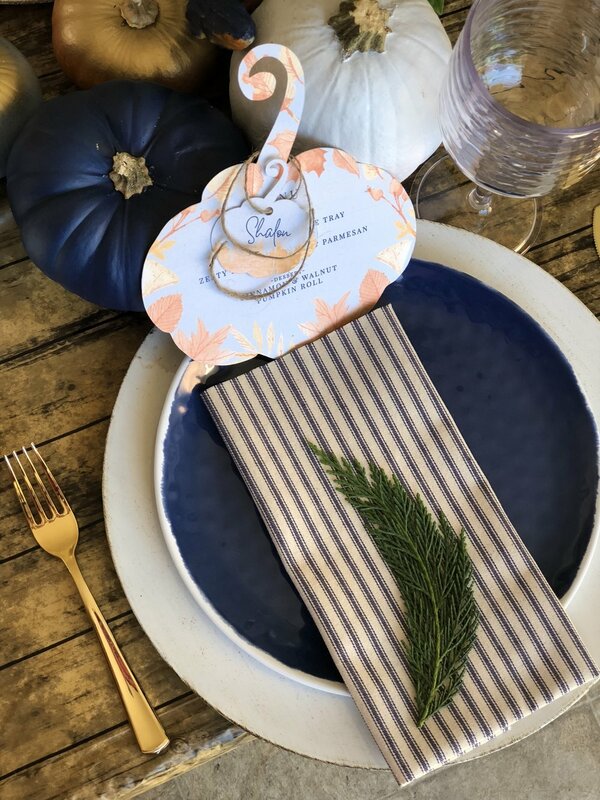 This Fall inspired tablescape would be perfect for any type of event. Maybe you’re celebrating a new baby that’s on the way or your recently engaged so a engagement dinner or bridal shower is in the works. Who says Fall has to be all leaves, oranges and yellows. This look could also be achieved with some popping fall colors like cinnamon, plum, emerald green, olive or crimson. 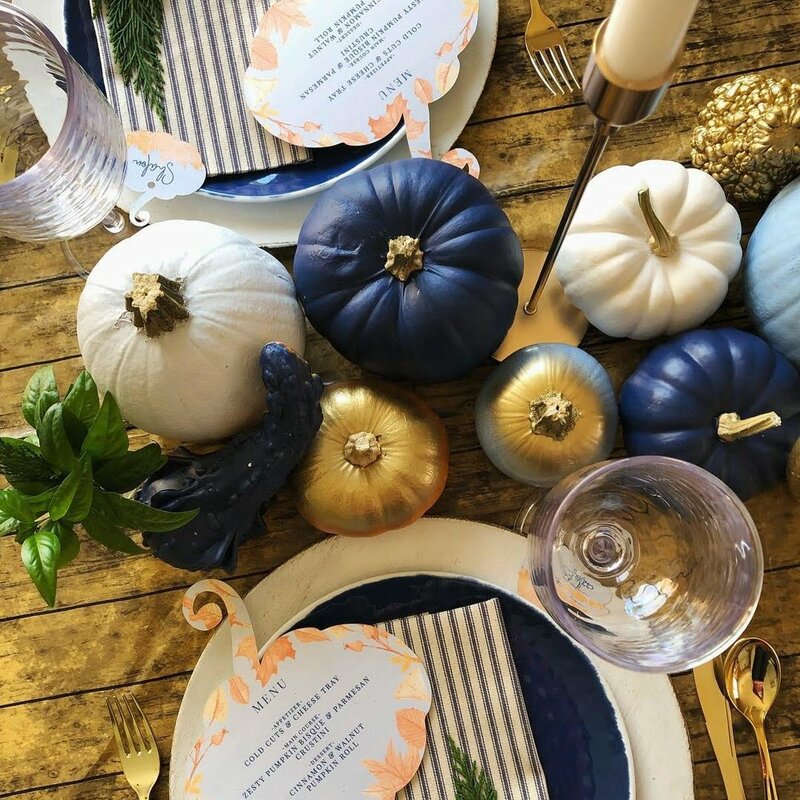 Couldn’t you just imagine those colors being the wow factor of your fall or holiday table!